Home News Hartley’s History in the News Again. Hartley’s History in the News Again. 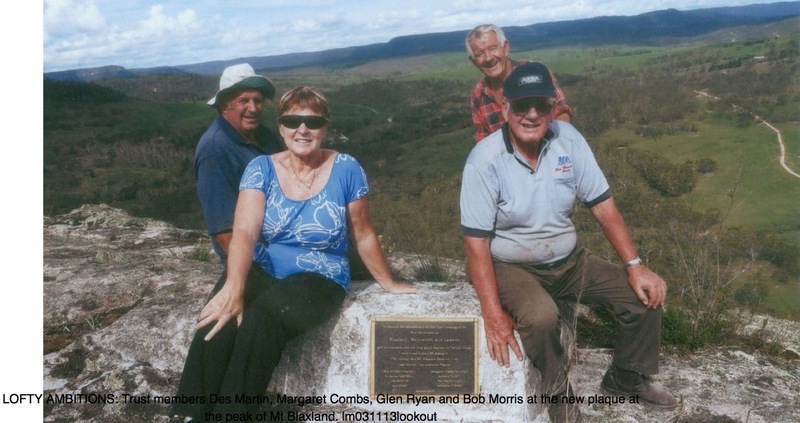 TO commemorate the Bicentennial celebrations for the Crossing of the Blue Mountains in 1813 by Wentworth, Blaxland and Lawson the trust of the Hartley Vale-Mt Blaxland Reserve has commissioned a plaque to honour this event. Well known heritage stonemason Michael Cambell of Mt Victoria graciously gave his time and resources to erect the plaque on top of Mt Blaxland, as part of his contribution to the historic event. The plaque, to mark the furthest point of historical crossing, has been erected only three metres from the historic plaques on top of Mt Blaxland. The Trust, who are all volunteers, will be completing further work at the historic Hartley Vale Cemetery to further commemorate this historic event as the historic cemetery also holds the grave of Henry Lawson’s father Piers Larson.